Emirates SkyCargo, the freight division of Emirates, has successfully transported some of the world’s best show jumping horses across three continents in the space of a month. The horses were transported from Liege in Belgium to compete in the first three legs of the Longines Global Champions Tour in Mexico City, Miami and Shanghai in April 2017. The air cargo carrier operated a total of 10 dedicated freighter flights each carrying 25 horse stalls to transport the equine champions and their grooms. Emirates SkyCargo worked closely with Peden Bloodstock, a specialist in horse transportation to manage the complex logistics involved in flying close to 100 horses across four different countries within the space of a few weeks. Emirates SkyCargo transported 93 horses in two flights from Liege to Mexico City for the first segment of the journey between 31 March and 1 April 2017. The horses, each weighing between 600-650 kgs, were transported in Emirates SkyCargo Boeing 777F freighters along with 11 accompanying grooms and about 30 tonnes of equipment. The flights lasted close to 12 hours and the horses arrived at their destination a few days ahead of the start of the championships. Incidentally all the winners of the CSI 5 level competitions* at the Longines Global Champions Tour event in Mexico City had travelled on board Emirates SkyCargo. 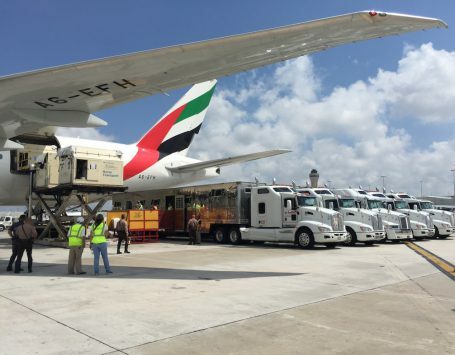 The second leg of the tour involved a relatively shorter three hour hop for the 93 horses from Mexico City to Miami onboard Emirates SkyCargo freighters. At the close of the event in Miami, the horses were brought back to Liege on 16 April 2017. For the next stop in the itinerary, the air cargo carrier transported 96 horses and 27 grooms in three separate flights from Liege to Shanghai on 22 and 23 April 2017 and back on 1st and 2nd May 2017. The jet-setting horses had approximately one week on the ground at each destination to compete in tournaments before being transported to the next stop on their itinerary. Dedicated and trained staff were on the ground at each destination to ensure smooth handling and maximum comfort for the horses. Emirates SkyCargo combines state of the art facilities including a modern fleet of wide-bodied aircraft and custom designed horse stalls along with exceptional logistical arrangements on the ground by working with specialists such as Peden Bloodstock. The result is a calm and comfortable environment that ensures the well-being of horses while at the same time complying to all international norms for the transport of live animals. The air cargo carrier regularly transports champion horses for leading equestrian competitions around the world. With a global network of over 150 destinations across 83 countries, Emirates SkyCargo has regularly transported premium horses across six continents. Earlier this year the carrier transported some of the world’s best racing horses to Dubai for the Dubai World Cup horse racing championship. Emirates SkyCargo also boasts of specialist facilities for horses such as a dedicated horse ramp for boarding horses at its freighter hub at Dubai World Central. Emirates SkyCargo is the largest international airline cargo operator in the world and operates a modern fleet of 259 all wide-bodied aircraft, including 15 freighters- 13 Boeing 777-Fs and two B747-400ERFs. On 9 April the 93 horses were then moved from Mexico City to Miami on two flights. 96 horses transported from Liege to Shanghai starting 22 April accompanied by 27 grooms and over 15 tonnes of equipment. On 1 and 2 May 2017 the 96 horses were flown back to their starting point at Liege. *CSI 5 is the highest international level for show jumping as designated by the International Equestrian Federation (FEI), the international governing body for all equestrian disciplines.